New rules were set for credit card companies last year, thanks to passage of the Credit Card Accountability, Responsibility and Disclosure Act, and the most significant changes go into effect February 22. Your credit card issuer can't raise the interest rate on your existing balance unless your card has a variable rate, a promotional rate period has ended, or you're more than 60 days overdue on payments. The issuer can raise interest rates on future purchases, but only after the first year an account has been open and only after you're given 45 days notice. If you decide to cancel a card, the credit card company must either structure your remaining balance to be paid over five years or set a minimum monthly payment that's no more than twice the percentage required for the old minimum payment. Your credit card company can't allow you to go over your credit limit and then charge you a fee unless you opt in for such a program, and any other penalty fees, such as late fees, must be reasonable as determined by the Federal Reserve. Credit card companies can't go back to a previous billing period to determine the interest charge in the current cycle. Anything you pay over the minimum payment due each month must be applied to the highest-interest balances first. 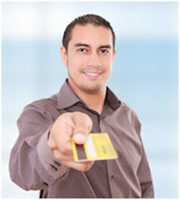 The interest rate on cash advances, for instance, is often higher than that on purchases. Credit card companies must mail billing statements at least 21 days before the due date, and the grace period must extend 21 days after the statement is mailed. Your credit card company must disclose in the billing statement how long it will take to pay off a credit card balance if you pay only the minimum due, as well as how much you would have to pay each month to pay off the balance in three years. If you're under 21, you must get a cosigner over 21 or provide information showing you have independent income to get a credit card. Marketing to college students will be restricted, too--no more free T-shirts just for filling out credit card applications on campus. 0 Responses to "New Consumer Credit Card Protections Coming Soon"